FILE - Journalists take part in a protest against the recent imprisonment by Myanmar authorities of Reuters journalists Wa Lone, 32, and Kyaw Soe Oo, 28, outside the Myanmar embassy in Jakarta, Indonesia, Sept. 7, 2018. Journalists are being jailed in unprecedented numbers across the globe, with 262 detained for their work at the end of 2017, according to the Committee to Protect Journalists. FILE - Detained Reuters journalist Kyaw Soe Oo and Wa Lone are escorted by police as they leave after a court hearing in Yangon, Myanmar, Aug. 20, 2018. The two most high-profile cases are of Reuters reporters Wa Lone and Kyaw Soe Oo in Myanmar. The two men were detained in December 2017 while they were investigating the mass killing of Rohingya Muslim men and boys by Buddhist villagers in the Rakhine state village of Inn Din. British barrister Amal Clooney is representing the two Reuters reporters. She says the Myanmar authorities did not want their story about the massacre at Inn Din to come out. "The attack on them is a chilling warning to other journalists worldwide," said Reuters President Stephen Adler. "Myanmar is not the only country where attempts are made to deter investigative news gathering, scare sources and whistle-blowers, dim the spotlight of reporting, and thereby allow officials to act in darkness with impunity." 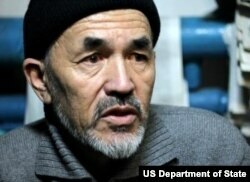 Azimjon Askarov, a Kyrgyz journalist, has been serving a life sentence since July 2010. CPJ's Simon says he was covering deadly ethnic clashes in southern Kyrgyzstan in the summer of 2010. During the trial, he and his lawyer were both assaulted. FILE - Indian journalists hold placards protesting against the attack on journalists and the arrest of Shahidul Alam, a renowned photographer and Bangladeshi activist as they gather outside Press Club in Kolkata, India, Aug. 8, 2018. "A free press is not an adversary, but an essential component of democracy," Ewen said.